Use for facial cleansing and cleaning minor cuts and scrapes as well as everyday bathing. Tea tree oil is a natural antiseptic that helps heal cuts and bruises, as well as skin conditions like acne, dermatitis, and psoriasis. - All oils and essential oils are certified organic to the National Organic Standards Program. 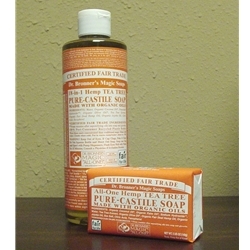 - Packaged in 100% post-consumer recycled plastic bottles. Packaged in 100% post-consumer recycled plastic containers. Ingredients: Water, Saponified Organic Coconut & Olive oils (w/ retained Glycerin), Organic Hemp Oil, Organic Jojoba Oil, Organic Tea Tree Oil, Citric Acid, Vitamin E.
Wrapped in 10% hemp-flax / 90% post-consumer recycled paper from Living Tree Paper Co.